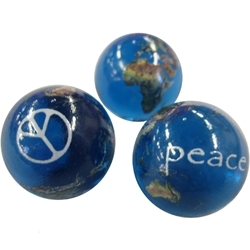 These 7/8" earth marbles have a transparent aqua base with all of the earth's land formations and "peace" printed on the surface. They are available in two styles. One style has the peace symbol in white print on the surface, and the other has the word "peace". Warning! : Choking Hazard. This toy is a marble. Not recommended for children under 5 years. Sold Individually.